CouponPages.Com, one of oldest and largest local coupon sites has expanded it's marketing efforts to draw attention to their printable coupons for local merchants. To build a strong brand, we don't rely on search engines alone. A huge part of our audience is from TV, magazines, radio and other offline media. We love our new billboard... it's 12 feet tall and 40 feet long! When CouponPages.Com started in 1996, there was no such thing as search engines. Back then, if you wanted people to find you online, you had to promote it offline. That's why CouponPages continues to deliver it's message to as many people as possible in every major media category. CouponPages has shared it's message of free printable coupons to more than 50 million people in places like magazines, newspapers, radio, TV, QR Codes, school sporting events, diner place mats and now a giant 40 foot billboard. "It's amazing how many web sites out there rely on search engines as their only source of traffic. They are missing so many other opportunities. 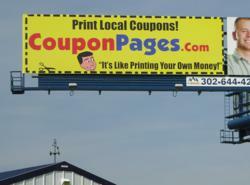 I love finding new places to advertise," said CouponPages founder, Joe Crescenzi. "To build a strong brand, we don't rely on search engines alone. A huge part of our audience is from TV, magazines, radio and other offline media. We love our new billboard... it's 12 feet tall and 40 feet long!" added Crescenzi. The printable coupon market is very big right now. However, CouponPages stands alone as one of the only local coupon sites that doesn't sell coupons, because unlike "Fad" sites like Groupon and LivingSocial, every coupon on the site is free. Customers enter their zip codes, then select free coupons from a growing list of local merchants. Another unique thing about CouponPages.Com is that all of the coupons are printable, which means you print them at home, then bring them into real stores in your neighborhood. According to Joe Crescenzi, "There are NO coupon codes on our site. I want our visitors to shop local, and support stores and jobs in their own communities. Coupon Codes don't do anything to bring customers back to local stores." The bulk of their TV spots run on stations like Fox Business Network, Great American Country, Sleuth, Animal Planet, National Geographic Wild, SOAPnet, CNBC, OWN (the Oprah Winfrey Network), Nickelodeon, Comedy Central, HDNET, TV Land, CNN, Food Network, Fox News, ABC Family, Bravo, SyFy, Golf Channel, RFD Network, Weather Channel, Oxygen, Bloomberg Business Television, AMC, Lifetime, USA, etc. According to Crescenzi, CouponPages is currently developing at least four additional commercials which will be launched in the coming weeks. "We are expanding into new markets very quickly, so it's important that we build a local audience in as many cities as possible. The focus of the upcoming ads will expand on the printable coupon spots, while adding additional information for merchants who are considering advertising online." Some of the spots feature PrintableCoupons.Com, which is CouponPages printable coupon blog, which focuses entirely on coupon deals as they are spotted online. 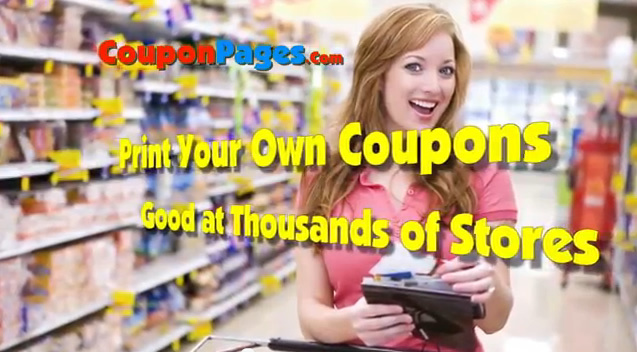 CouponPages.Com is one of the oldest and largest printable coupon sites that features printable coupons from local merchants. 100% of the coupons on CouponPages.Com are printable. The site does not feature "Coupon Codes" that are used to buy things online. 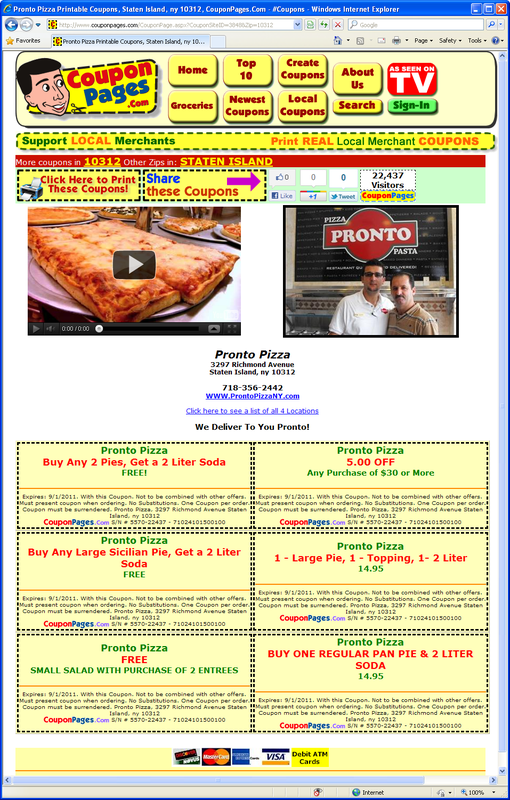 "Every coupon on the site is a printable offer you can use in your own backyard" says Joe Crescenzi.